Welcome to the Indiana Health Industry Forum (IHIF)! IHIF is a 501(c)6 not for profit trade association for companies in the health science industry. Our funding comes primarily from annual membership dues and is reinvested in programs and services that assist our member companies directly and contribute to the growth of the industry across the state of Indiana. IHIF is the Indiana affiliate of the Biotechnology Innovation Organization (BIO) and works closely with other national trade associations and related groups. The diverse members of the Indiana Health Industry Forum generate the collective voice of the state’s health and life science industry. 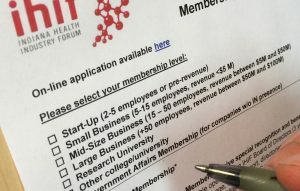 The Forum connects key stakeholders to enhance business networks, advocate for member interests, develop workforce skills, and provide strategic vision in the interest of growing the state’s health industry economy and reputation. For every organization, large or small, IHIF provides a number of benefits that cannot be found anywhere else. IHIF helps your business create a network that increases interaction both between IHIF members and with health industry partners across the state, county, and around the world. This helps provide a forum for business to business networking that can help you reach short and long term milestones, more quickly. The Forum provides guidance and leadership on public policy issues that contribute to innovation in the health science sector, deliver therapies to patients in need, and further the development and growth of our member companies. IHIF works at the federal and state level and partners with several other organizations and groups to support specific initiatives and legislation. IHIF is doing its part to support Indiana’s economic development efforts in the health and life science industries. The Forum leads development and implementation of a statewide strategic plan to provide industry driven guidance on many topics. To further support workforce development, IHIF is working to help bridge gaps between industry and academic partners and support select educational programs from early education through post-doc levels. Finally, through our participation in the BIO Business Solutions Program, our Members have access to discounts on a wide variety of products and services to help stretch your dollars further. The program includes a variety of programs to benefit bioscience, medtech, and service provider members. Membership in IHIF can be an advantage to people in your organization that work in research and development, finance, business development, government affairs, marketing, HR, and many others areas and in doing so, provide benefits and services only available through this unique organization.